Emma Ruth Lewis of Americus has called the same house “home” for the last 30 years. However, the last three of those years have been less than perfect. Her home was burglarized, leaving her susceptible to future break-ins as the door would no longer shut properly. Since then, Emma has been afraid to be in the house alone. On top of that, as she aged her knees began deteriorating, leaving her nearly unable to climb the stairs into her home. Everything began to change for Emma when the Americus-Sumter Fuller Center became involved. 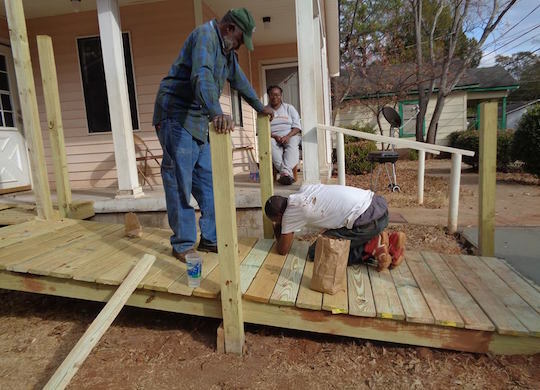 With their help the home now has a ramp to ease her knee problems, new vinyl siding, a new water heater, and a secure door to deter future robberies. Her daughter, Renee Lewis, is moving out of the house this week. She is overjoyed knowing her mom will be safe without her there. Showing the true compassion in the community, The Fuller Center wasn’t the only group involved with this home. As news spread of Emma Ruth’s situation, neighbors, community members, and the church congregation at Americus Holiness Deliverance Temple descended upon the home, helping in any way they were able. When asked about why they felt drawn to this project, the team has reached a simple conclusion: Emma needed help, and they were able to provide that help. As for Emma, she rests easier knowing her home is now safe and accessible, and that the community is truly looking out for her. To get a better look at the scene of the Lewis home, take a look at the video below!